Sarah Mac, Ben Loyd-Holmes, Neil Newbon et al. Deep in the Amazon jungle a group of scientists are on a dangerous mission. When their guide suddenly abandons them they find themselves in a savage and hostile environment. 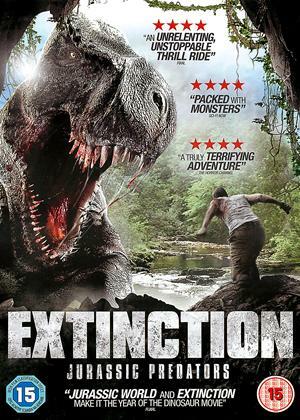 However, things turn deadly when they find they are in the middle of a hunting ground for a pack of prehistoric predators long thought extinct. These, dinosaurs have been living undisturbed for millions of years, but now the prehistoric predators have new human prey to hunt! I thought, for some strange reason this was some kind of follow up to the Jurassic Park movies. My bad. What it really is, unfortunately, is yet another feeble attempt to create a movie out of camcorder footage. Blair Witch has an awful lot to answer for. The acting is pitiful as is the strange models used as dinosaurs. It looks like it was filmed in some local woodland with a few trips to a zoological garden thrown in. I gave up on any attempt to actually watch the movie right through once I realised it was all third party camcorder footage, and proceeded to fast forward to various points throughout the length of the film. It is all the same and doesn't get any better. Do yourselves a big favour and leave this well alone, definitely one for the bin. There's not a lot to say really, awful 3rd rate actors and yet another film done with a camcorder. The special effects were not, it was so bad I kept fast forwarding but gave it up as a waste of time. I think I'm being generous giving it one star.